Starring: Peter Sarsgaard, Carey Mulligan, Alfred Molina, Dominic Cooper, Rosamund Pike, Olivia Williams, Emma Thompson, Cara Seymour, Matthew Beard, Sally Hawkins. Having garnered some Oscar attention upon it’s release with nominations for Best Picture, Actress & Screenplay, I found this to be a film I should probably check out. It’s not something I’d normally be drawn to but in this case, I’m very glad I was. 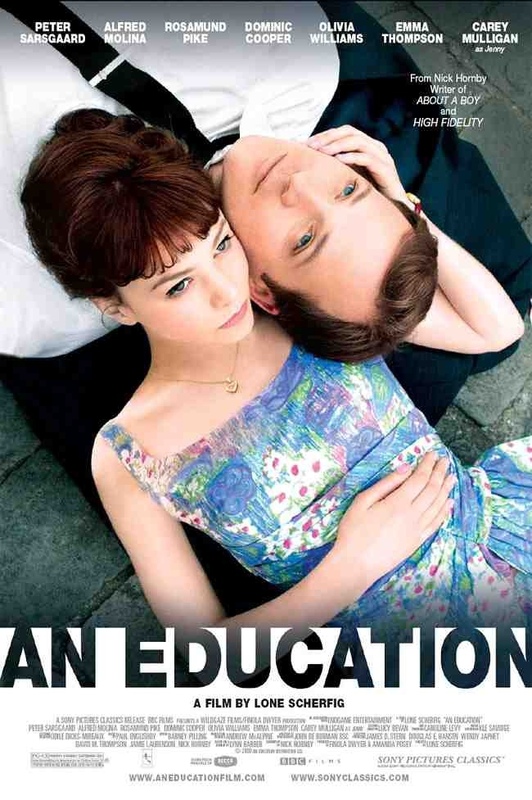 Jenny (Carey Mulligan) is attractive, doing well at school and set to land a place at Oxford. Then she meets David (Peter Sarsgaard), an older man. He dazzles her with the edgy world beyond her ’60s suburban life, and soon a very different destiny opens up before her. But everything is not quite as it seems. Essentially this is a coming-of-age story but it’s handled with such care and restraint by Danish director Lone Scherfig, that it becomes so much more. It’s beautifully shot with a fine rendering of 1960’s English suburban life. A lot of attention has been given to this, and it shows. There are blink and you’ll miss them subtleties between the characters and the acting by everyone involved is first class. Alfred Molina as Jenny’s domineering but loving father; Peter Sarsgaard with his perfectly honed ability to be charming yet bordering on creepy; and Emma Thompson lends some weight with her matriarchal head-mistress. The real star though, is Carey Mulligan. She exudes wisdom yet naivete, confident yet doubtful. It’s a marvellous performance and thoroughly deserving of her Oscar nomination. Throughout the course of the film there is an anticipation of tragedy that never really transpires, but it doesn’t matter. What we are given is so much more believable with these very real and nuanced characters culminating into a quite beautiful rite of passage tale. As Jenny finds it hard to resist the attractive and flamboyant lifestyle of David, so did I in resisting this film with it’s exquisite attention to detail and all round, solid, confident filmmaking. This entry was posted on February 1, 2012 at 9:31 am and is filed under Drama, Romance with tags 2009. You can follow any responses to this entry through the RSS 2.0 feed. You can leave a response, or trackback from your own site.